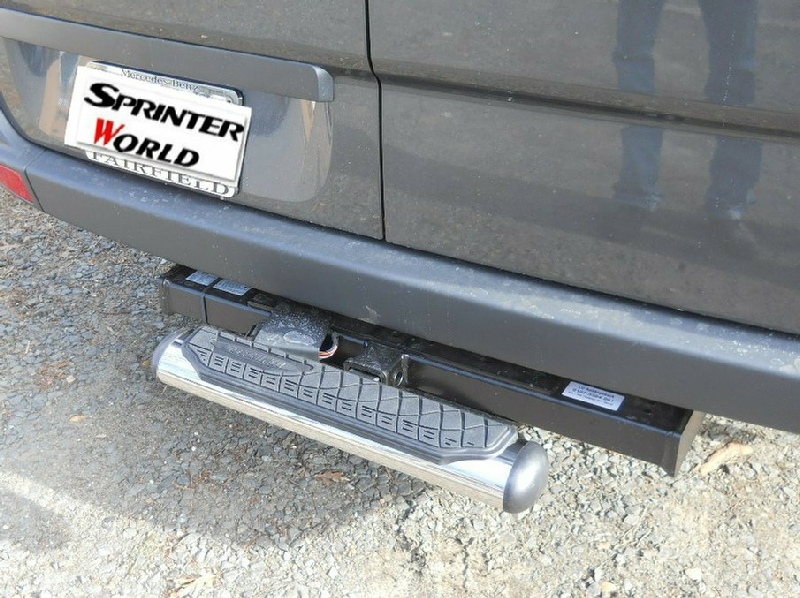 Our Rear Bumper Step will save your body some wear-and-tear, especially if you are using the rear doors during your work day. The surface of the bumper step has an aggressive, high grip tread that will allow water, snow and ice to drain through quickly. It's made of galvanized steel, and has thick rubber rub-strips on each end. 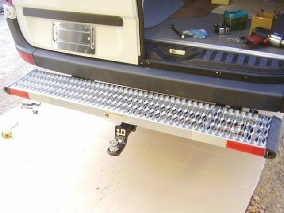 The heavy steel brackets that support the 59" long x 9.75" wide bumper step bolt directly to the existing holes in the rear of the Sprinter's frame. The supplied hardware will allow you to install the bumper step in about 20 minutes using just a few hand tools. An easy to follow, one-page instruction sheet is included. You may want to check out our Grab Handles to accompany your new bumper step. Problem Solved! Do you need a rear BumperStep but also need a trailer hitch? Now you can have both. We now offer a bumperstep that can be used with an aftermarket hitch (which you can purchase from us or another dealer). It's a clean, well designed approach that allows you to use either a Draw-tite # 75601 or a Curt # 13358 hitch. 1. This cannot be used with a factory Sprinter hitch. 2. It will not fit the 144" sprinter with dual rear wheels. 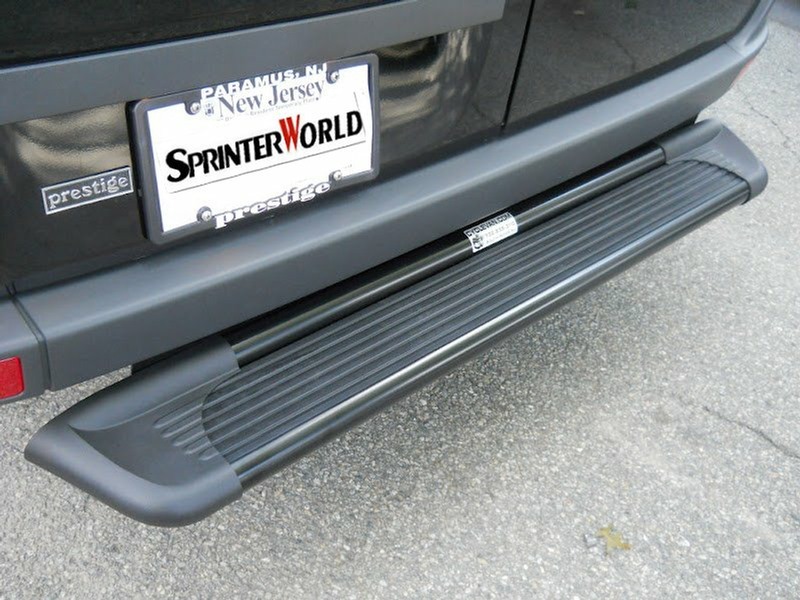 Now available... our new black BumperStep for the 2007-2019 Sprinter. 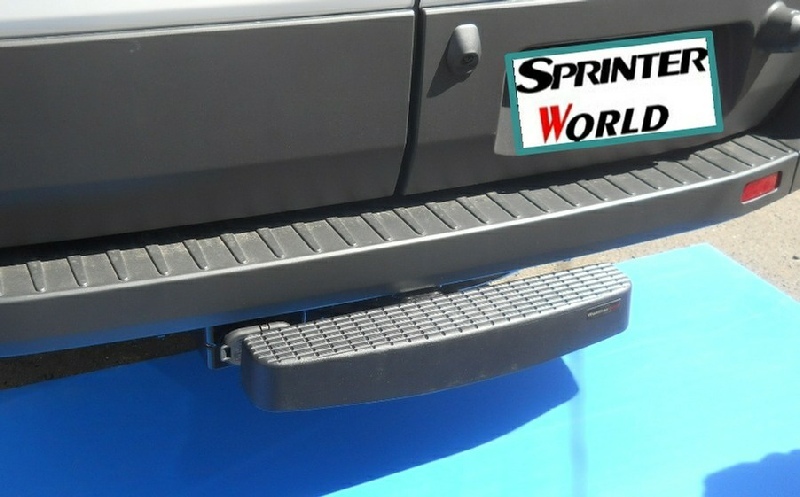 This sleek, black step can be used with an aftermarket trailer hitch or without a hitch, and it matches our running boards perfectly. Note: Trailer hitch sold separately. 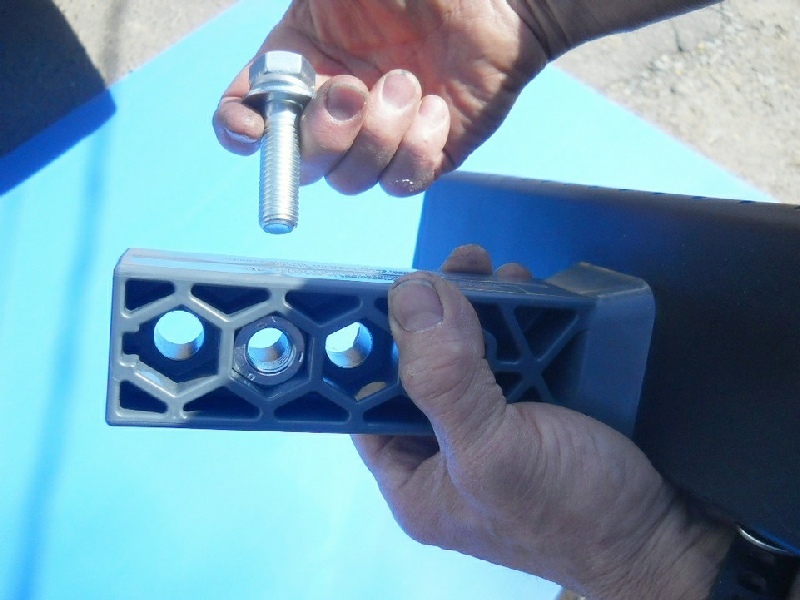 Installation is quick and easy, because all of the included brackets and hardware fit the existing frame holes. There's even a helpful video below that shows how easy it is to install, even in your driveway. Here’s the removable hitch step that slides right into your hitch and tightens down rock-solid. The simple kit contains everything you need for a rattle free installation. Available in stainless steel, which means no rust. 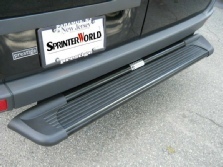 Now available for the 2002-2006 Sprinter... the same great rear bumper step we've offered for the newer Sprinter. You get a generous 60" long step area and a bracket kit that allows installation to take place in about 20 minutes with common hand tools. The beefy brackets bolt to existing holes in the rear frame making the whole operation a cinch! NEW: Weathertech slide-in hitch step in composite construction. Nothing to rust because there’s no metal except for the no-rattle nut & bolt kit. All black finish, measures 23.5” wide.